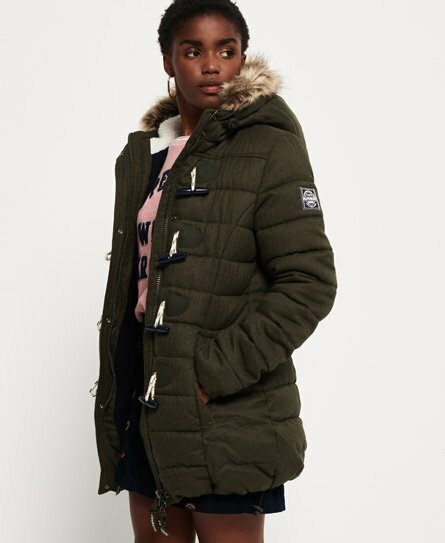 Superdry women’s tall marl toggle puffle jacket. This classic hooded jacket is made from an attractive marl finish fabric in a quilted design and features a detachable faux fur trim to the hood, with Sherpa lining and a toggle. The jacket also features twin zipped pockets, zip and toggle fastening and an elasticated hem and cuffs. Inside, the puffle jacket is fully lined with a soft and thick fleece fabric. The jacket is finished with an embroidered Superdry logo on the back and a Superdry logo badge on one sleeve.